Tropical Storm Nate, as it became this morning, continues its trek towards the U.S. Since yesterday, the storm’s path has shifted west, with landfall now expected around New Orleans, though of course the path could change as the storm moves closer. 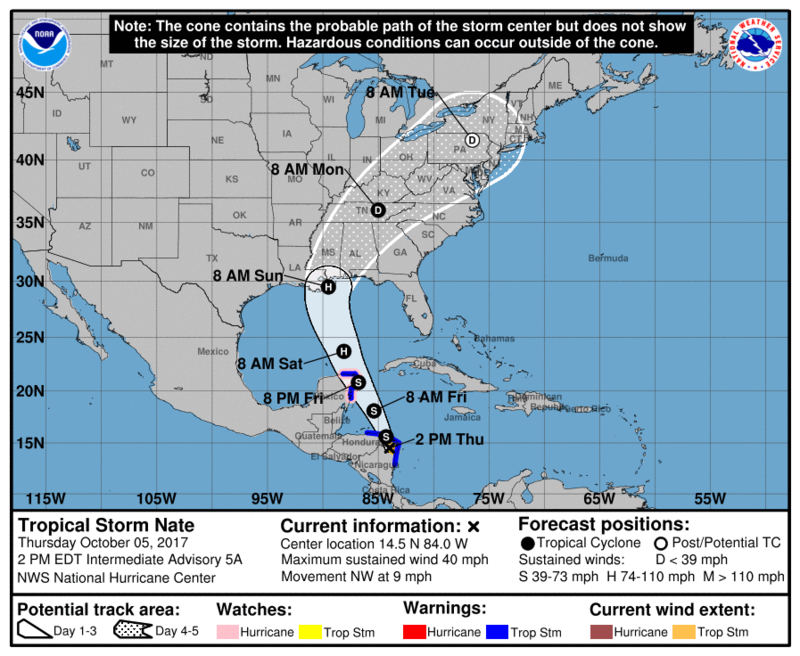 Nate is currently heading over Nicaragua towards the Yucatan Peninsula in Mexico, and is expected to strengthen once it gets back over water in the Gulf Coast. Based on the current trajectory, the storm will strike the U.S. as a Category 1 storm on Sunday. Given the speed of the storm, it will not have much time after leaving Mexico to strengthen; however, if the system slows down, it may have time to grow beyond a Category 1. After Hurricane Harvey, all major oil producers are monitoring the storm closely. Officials from ExxonMobil, Phillips 66, Shell, and others have released statements saying they are watching the storm for potential impacts on operations. ExxonMobil indicated they are evacuating personnel from their Lena platform in the Gulf of Mexico. So far, 6 production platforms have been evacuated, less than 1% of all Gulf of Mexico platforms, according to government data. Based on the storm’s current track, it will land well east of major refineries in Texas. However, the storm’s path remains largely unknown and could shift either west or east. Mansfield is on Code Orange for Louisiana (New Orleans), Mississippi, Alabama, Georgia, and Florida. The move to Code Orange signifies that operations teams will be preparing for storm conditions in the coming days. After the rapid intensification of other storms this season, Mansfield is taking caution to make sure customers remain supplied. If you have questions or would like to order fuel ahead of the storm, please contact your Mansfield sales representative or customer relationship manager.